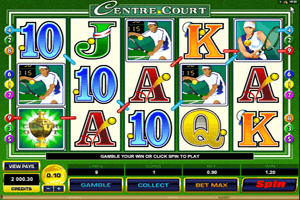 Centre Court is a sport themed video slot machine, while most slots are usually themed around soccer or other sports, Microgaming dedicates this game for the Tennis fans. This is why the game is called Centre Court and this is why the entire interface of the slot machine is inspired by the sport of tennis. For example, players will see that the background of the reels is of green color, which is of the same color as the tennis court. They will also notice that the lines that separate the reels from each other are made from white chalk, which is used to define the tennis court as well. Play Centre Court Slot here. As for the symbols that spin on the slot’s five reels and nine winning lines, they include a female tennis player, a tennis cup, a tennis ball, a male tennis player and poker card symbols that come with tennis balls bouncing around them. The tennis scatter symbol is the icon responsible for triggering the free spins bonus round. Through this round, players will earn 18 free spins with a multiplier that can reach up to 5x. All what players need to get is 3 tennis balls anywhere on the reels. The Golden Cup symbol is the wild icon that will fill in for other icons anywhere on the reels. The only icon that it will not fill in for is the scatter tennis ball.